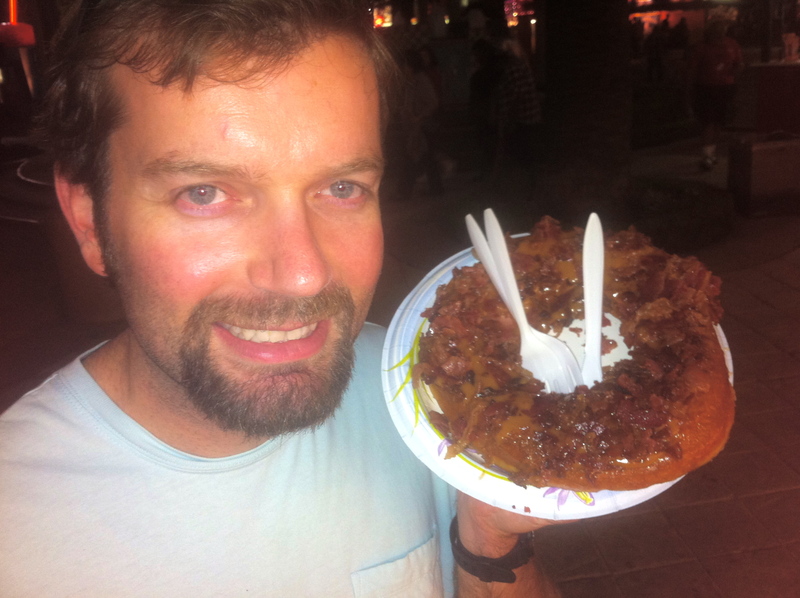 A few years ago, I experienced a maple bacon donut. DH and I were at the LA County fair, and it was the featured food. And it was amazing! First of all, it was as big as your face. The enormity of it alone made it fun, but really it was the crispy warm freshness that made it especially good. It was the perfect balance of fried, sweet, and salty. It is the epitome of fair food. There’s my hot hubby showing off that wonderful donut! I wasn’t exaggerating when I said it’s as big as you’re face. Since then, I have started to see maple bacon desserts in various forms all over the place. 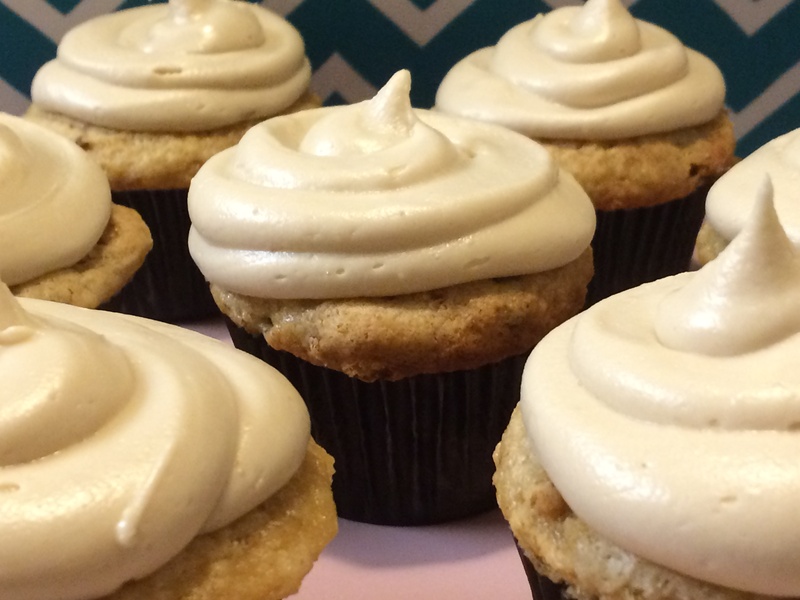 They all look so fun, so a couple years ago, I tried a maple bacon cupcake recipe myself. But that recipe was too involved and I haven’t done it again since. 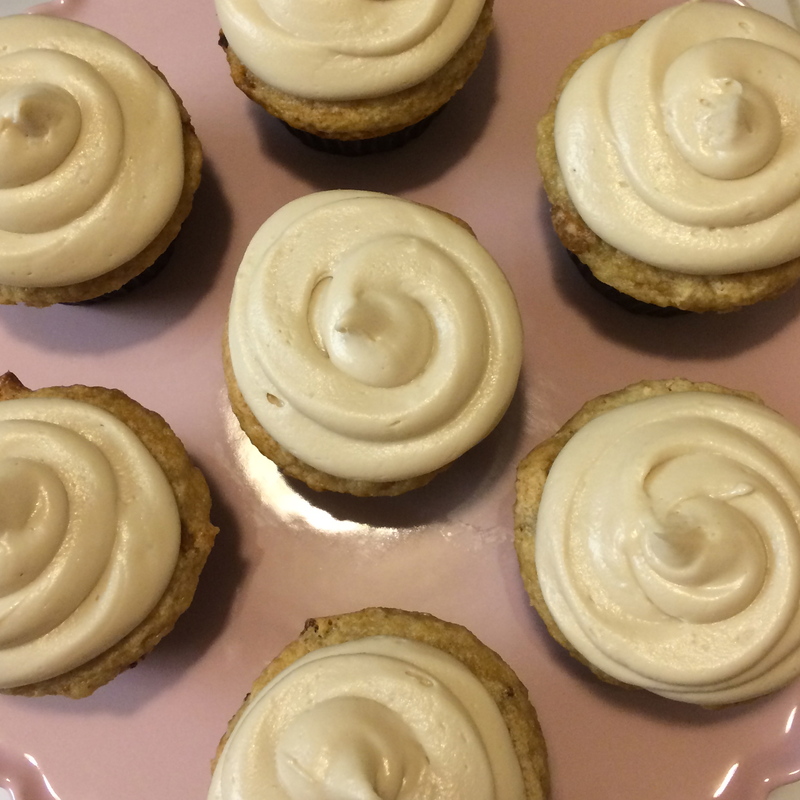 Recently, however, I happened to have about six pieces of cooked bacon that we didn’t have a specific plan for, so DH suggested I make maple bacon cupcakes again. I decided to go for it, but instead of following the old complicated recipe I used before, I wanted to keep it simple and experiment. Here’s what I did. Mix first five ingredients in a medium mixing bowl until incorporated (careful not to over mix). Batter will be thick. Crush up the bacon and add to batter. Mix briefly. Spoon batter into cupcake pan to be two thirds full. Bake for 20-25 minutes until tops are dry. 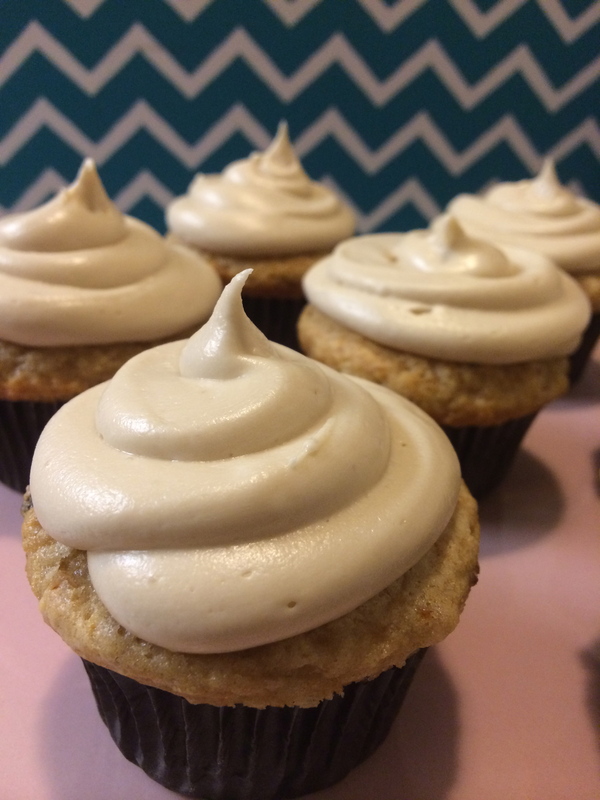 When finished, allow to cool completely before frosting. In stand mixer, cream together butter and cream cheese until smooth and fully incorporated. Add extracts and salt and continue mixing. With mixer on low speed, gradually add sugar. 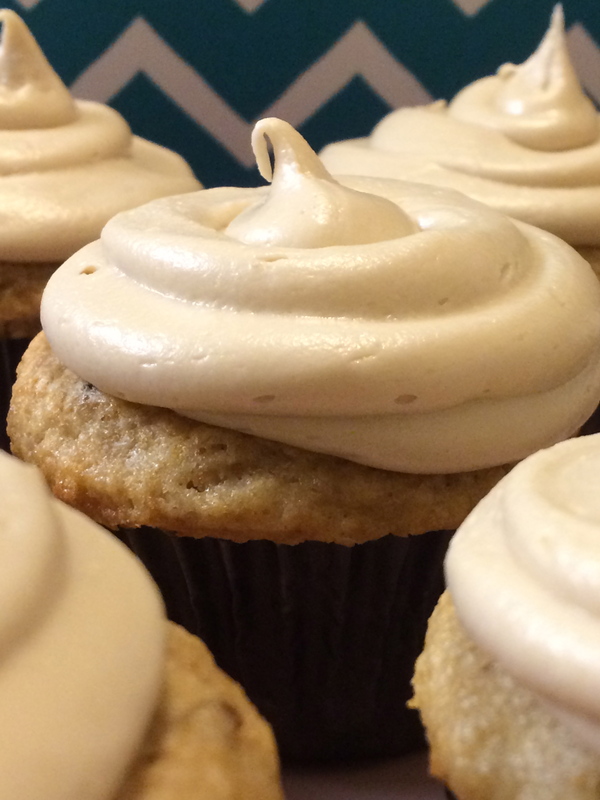 Once sugar is added, frosting may be crumbly and pasty. Continue mixing and add milk one tablespoon at a time until desired consistency it reached. Spoon frosting into a ziplock back and seal. Cut a corner off the bag, and pipe onto cupcakes as desired. 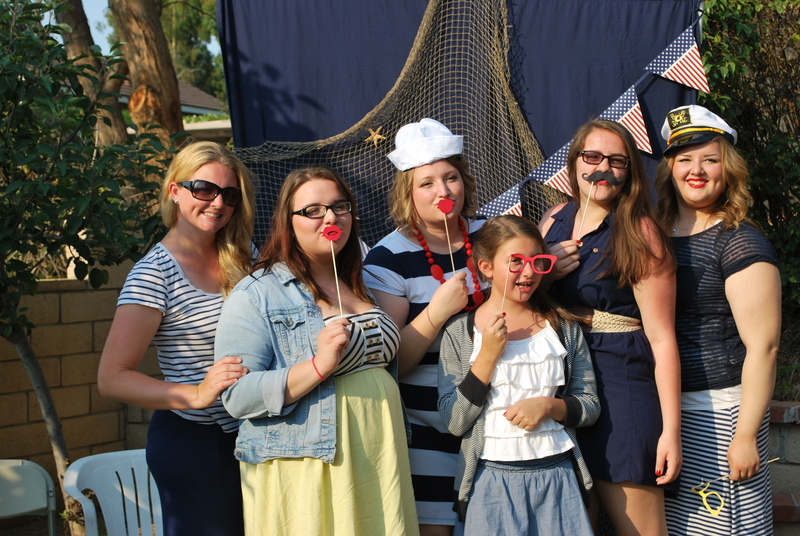 I shared the invitation and the food in a previous post, about a baby shower I threw for my friend Katie. Now, I will share some of the decorations and activities. 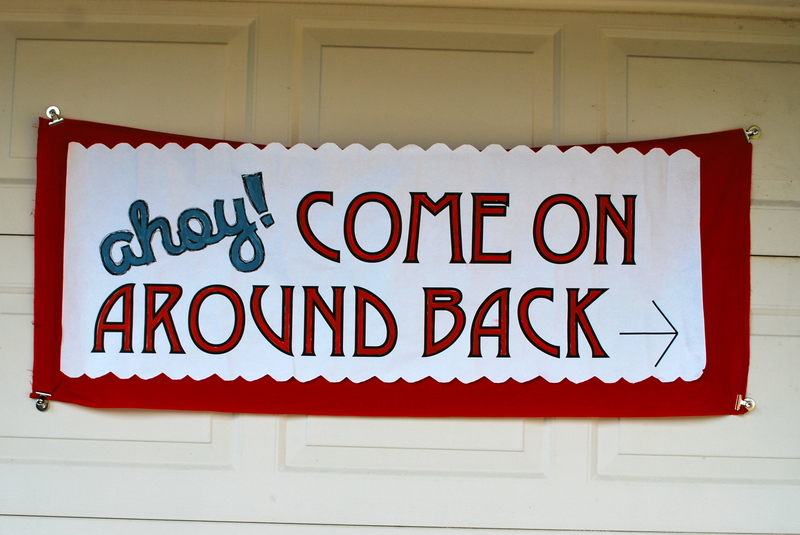 We hung this sign up on the garage door that directed guests to go around the side of the house to the back yard. 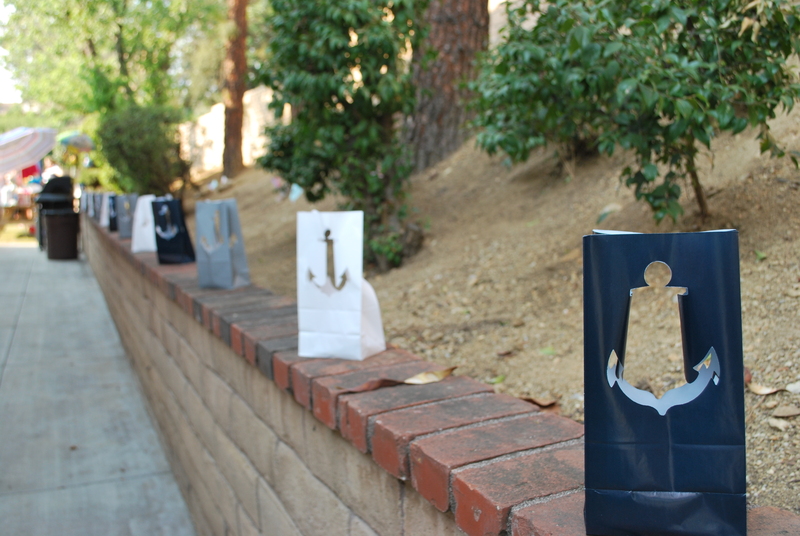 As guests walked back, they started to see evidence of the nautical theme with these cute luminaries that I ordered from Oriental Trading Co.
We put a picnic table near the entrance for guests to drop off their gifts. 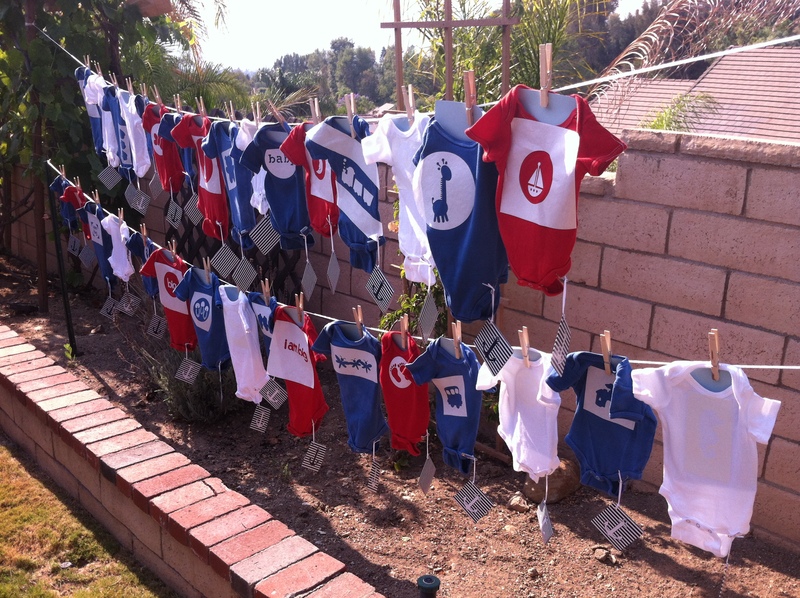 I put out some small diapers and a bunch of sharpie markers. 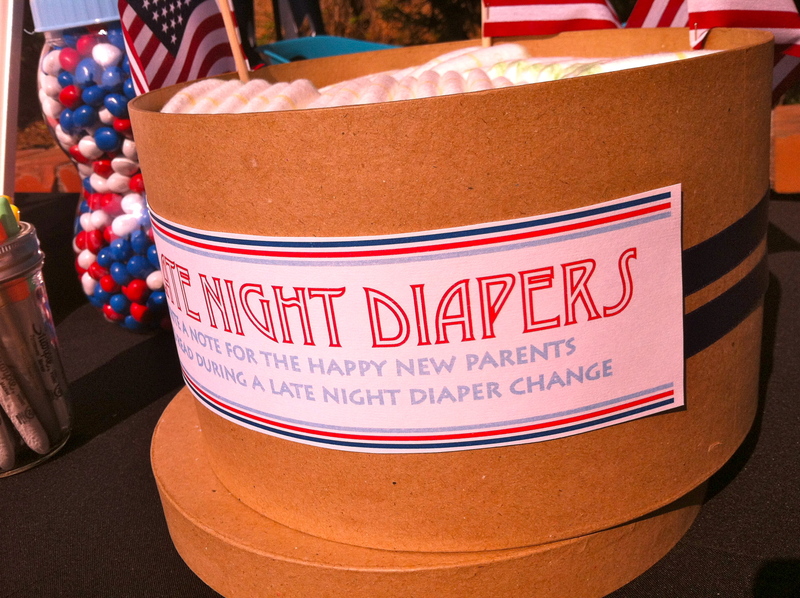 We instructed guests to write a note to the new parents that they could read during a midnight diaper change. Some notes were sweet and encouraging, some were funny. 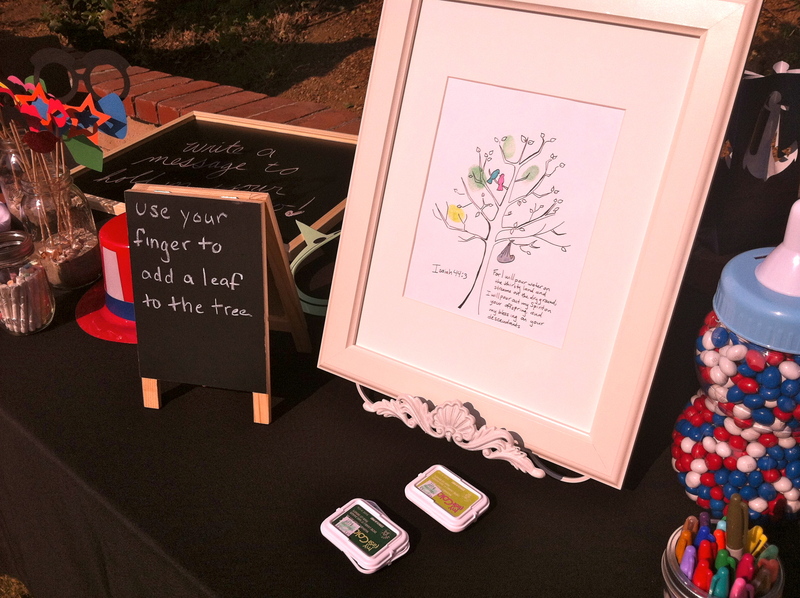 Instead of a guest book, we asked guests to add their fingerprint to the tree. Katie and Todd now have this hanging in their home were they can be reminded of all the people who love and support them. 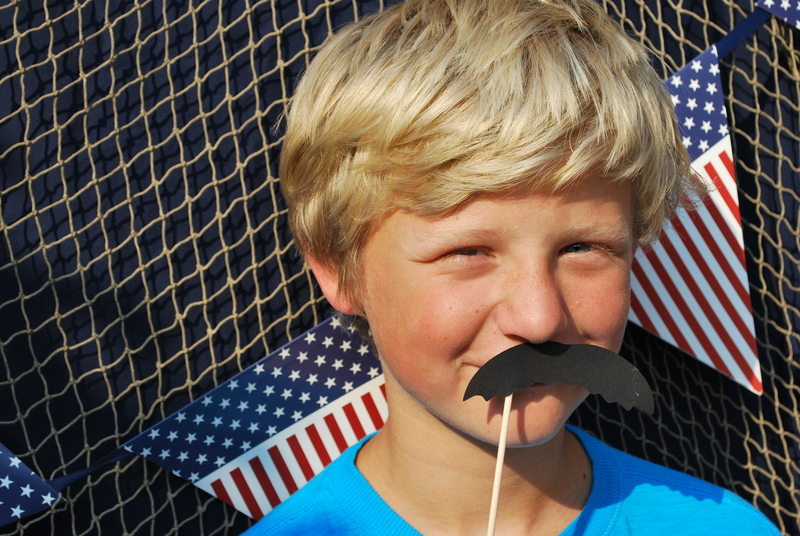 We created a photo booth backdrop using pvc pipes and a flat bed sheet. I hung a bit of fish netting and a cute red, white and blue pennant banner on to it. 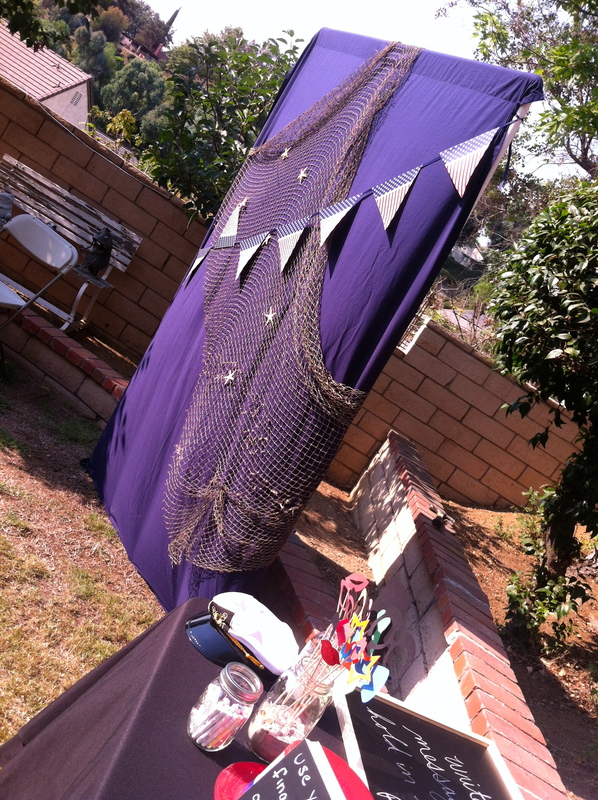 I found a collection of props to use including a skipper hat, a sailer hat, chalk board, and some paper cut-outs. There we are with our dear friends shortly before they became parents. 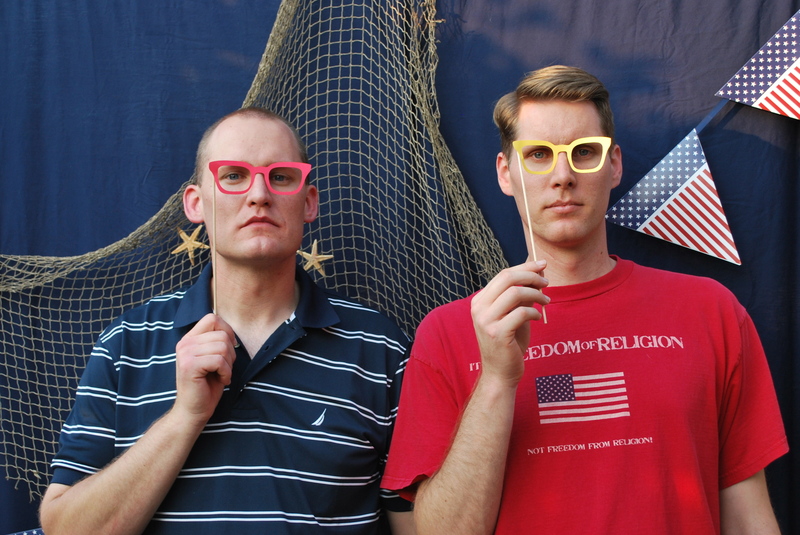 This is one of my favorite photo booth shots. Clearly the guests got creative and had tons of fun. Another activity was onsie decorating. I used Rit Dye to dye some of the onsies red and some blue. 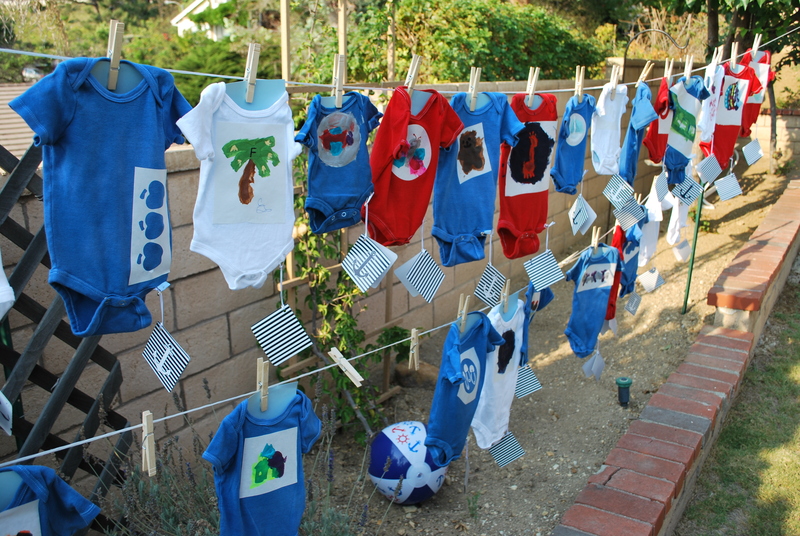 I used my cricut to create a bunch of freezer paper stencils that we pre-adhered to the onsies. 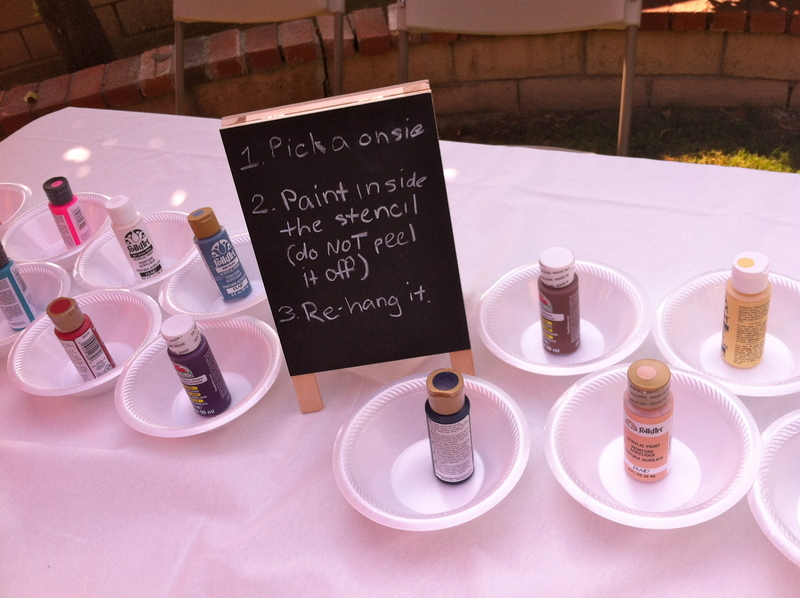 And buy hanging them up, they served as an activity and a beautiful decoration. Towards the end of the party, DH and I went over and started removing the freezer paper to reveal the finished onsies. If you look closely, you can see that I attached tags to the onsies. 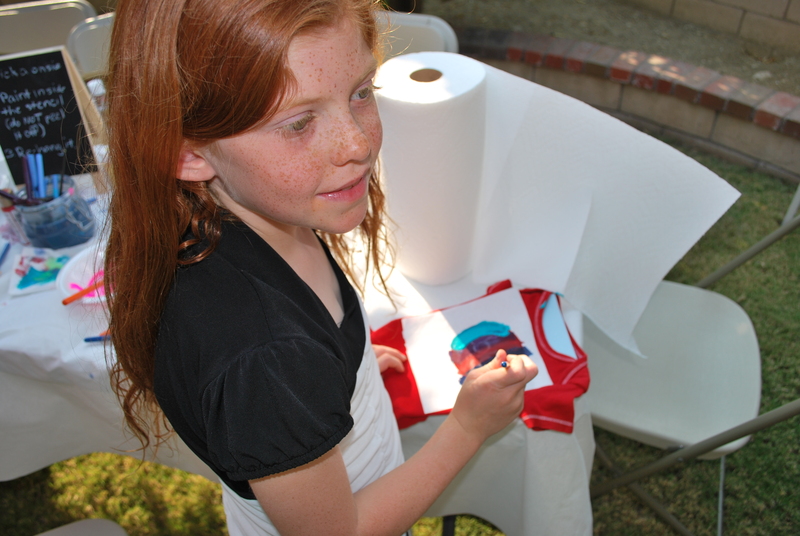 We did this so that guests could sign the ones they painted and Katie and Todd would know who made them. Katie’s sister brought this wreath made out of cloth diapers and cute socks as a gift and a decoration. 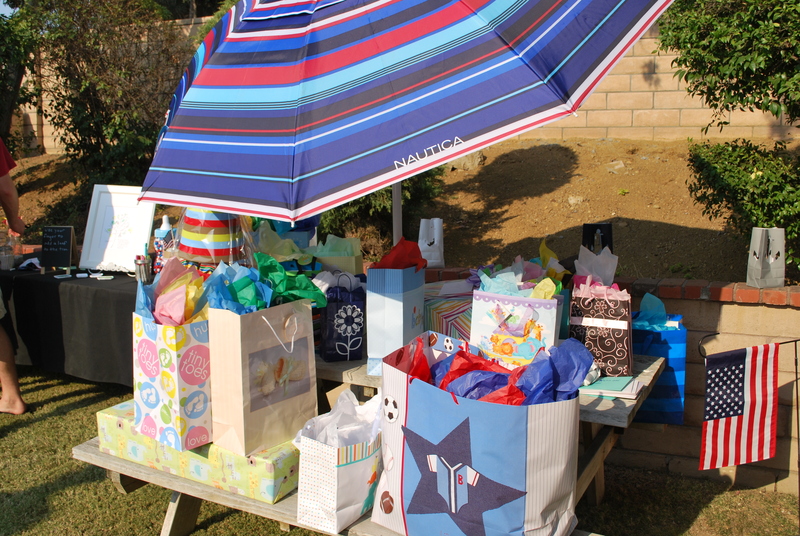 After the gifts were opened, we put out the favors on the now cleared off gift table. 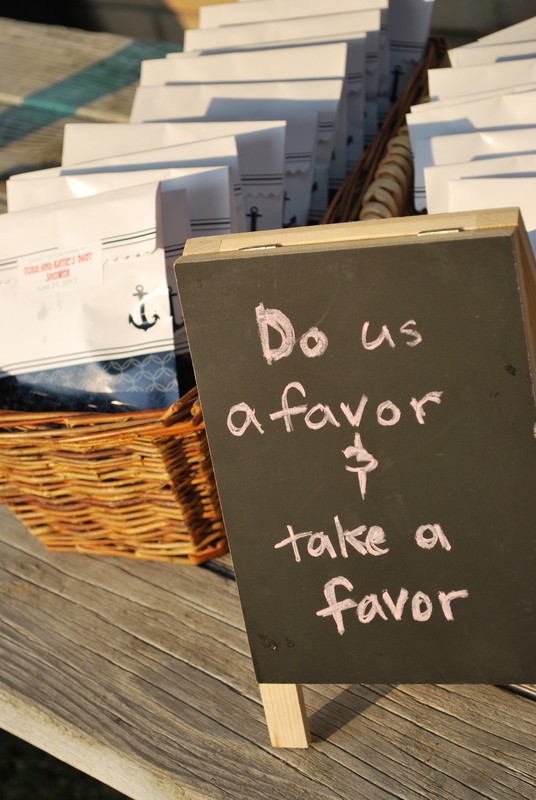 The favors were wrapped up packs of gourmet cookies. 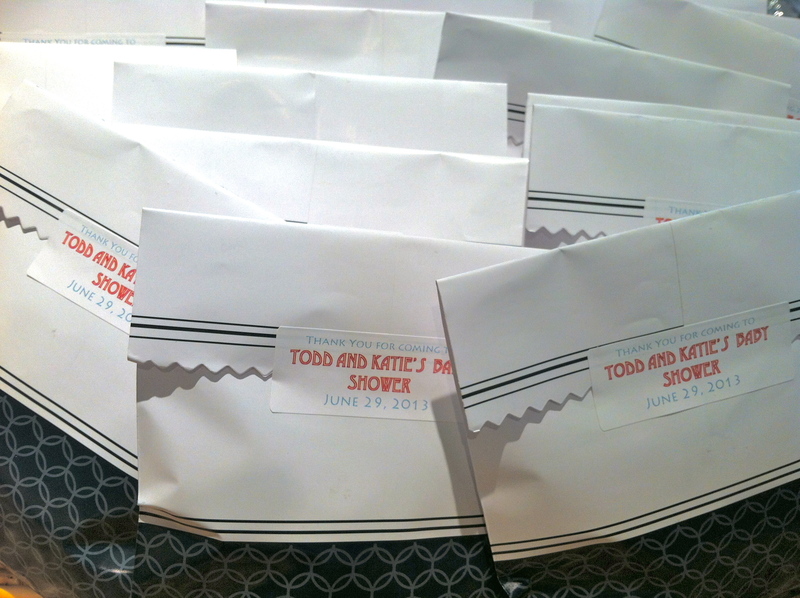 I found these bags on Oriental Trading and printed labels to match the invitations. 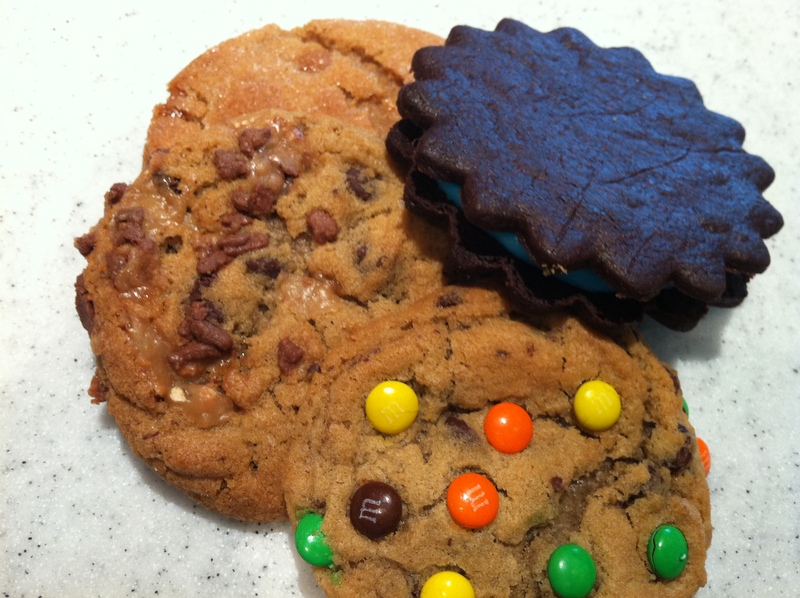 The cookies were all home made. My mom and I made brown butter salted caramel cookies, chocolate sandwich cookies (based of this recipe), heath chocolate chip cookies and m&m chocolate chip cookies. Each pack had two. 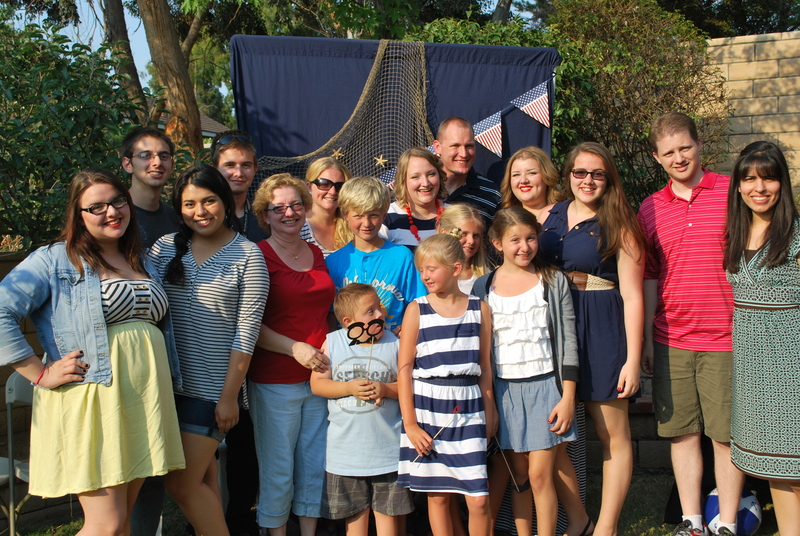 Here are a couple more shots… not of anything specific, but of the party as a whole. 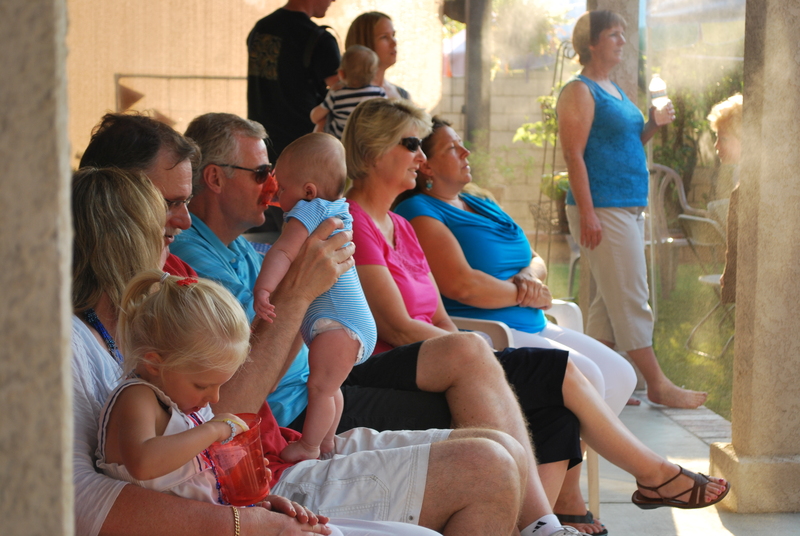 It was a very hot day, so several of the guest lined up under the misters to cool off and watch the gifts be opened. And here are my two guys! 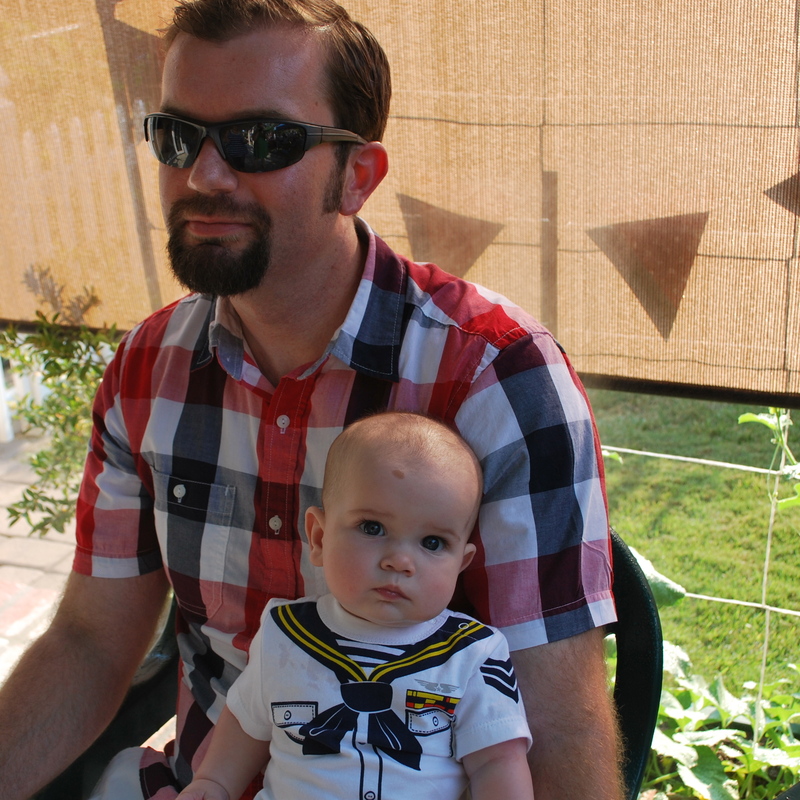 My cute little man in his sailor onsie that I found at Old Navy and my hot hubby who was so incredibly helpful throughout the entire party planning and throwing process. 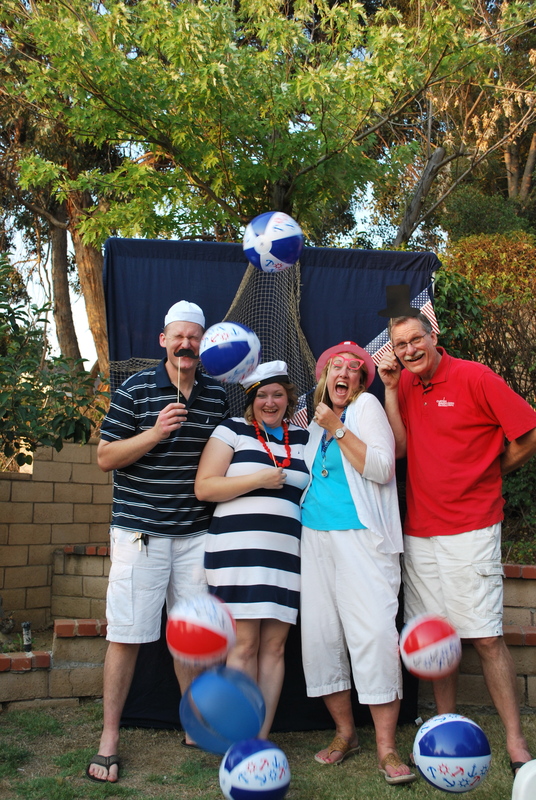 Within about a week of this party, Katie and Todd got a call that a ten month old boy needed a home. Shortly after, a newborn girl was placed in their care as well. They are blessed with a full home and full hearts. And as their friend, I am so very happy to be a part of it. I have been meaning to write this post for a couple months now. I have been putting it off, though, because I have been going back and forth between wanting to simply showcase the party, or offer some how-to’s of some of the details. Well, right now, I’m going to do a showcase. I plan to add a few other posts here and there with more details for some of the projects. But for today, I’m going to keep it simple. Before I share the party, I want to share the story. I have known my friend Katie since we were really little girls. I’m talking, like, 25 years or more! I don’t even like saying that because it makes me feel old. But that’s how far back our friendship goes. She and her husband got married young and have recently celebrated a decade of marriage. Over those years, they wanted to start a family, and unfortunately, things didn’t go as planned. 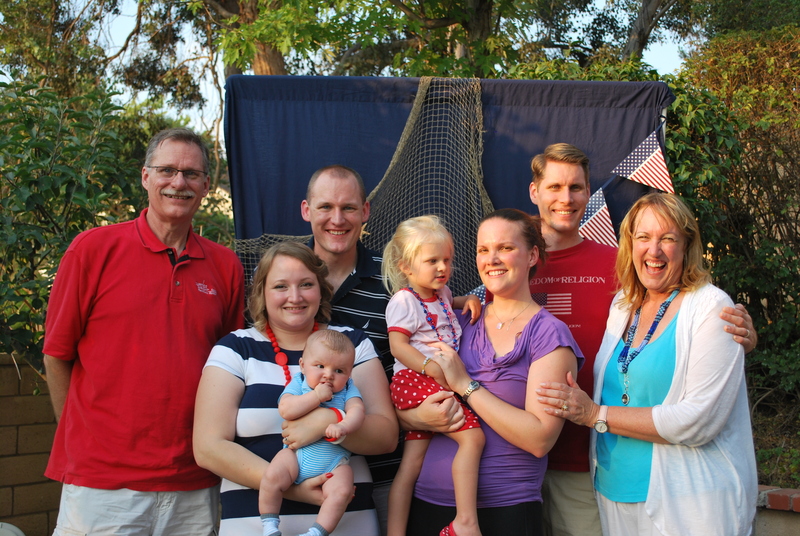 But the Lord put it on their hearts to adopt and this last summer, they finish the preparation and were just waiting for the call telling them a baby was waiting. 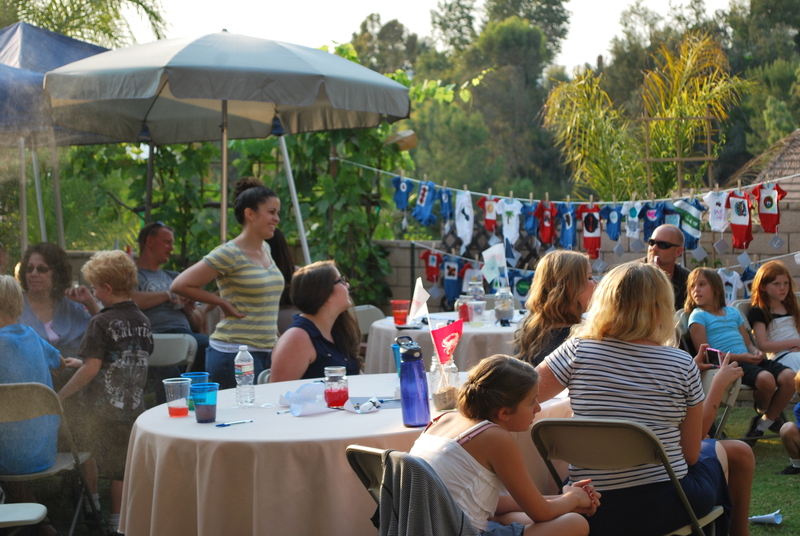 So, to help them prepare, my husband and I threw them a baby shower. 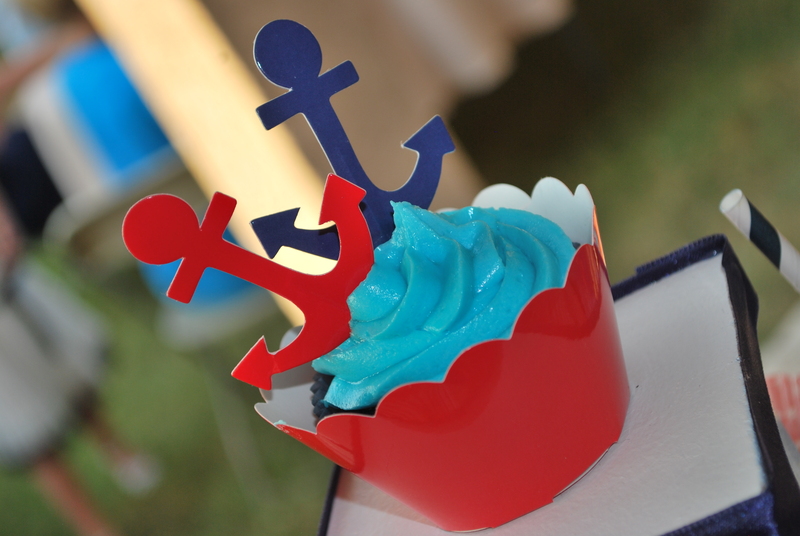 Nautical themes are pretty popular these days and they can be pretty gender neutral. Also, it’s not too frilly which we thought was appropriate for the men who were invited. 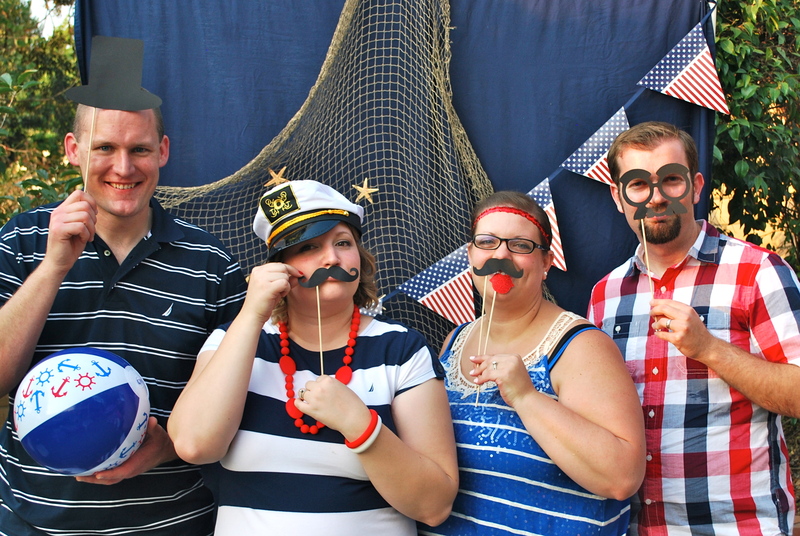 We wanted to make sure Dad-to-Be and his friends were comfortable. 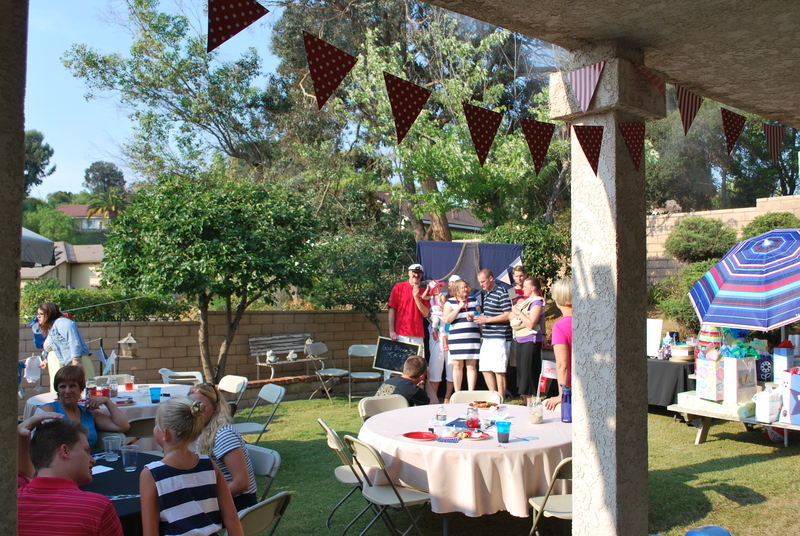 The party was also close to the Fourth of July, so I was able to find lots of wonderful red, white and blue decorations to incorporate. Katie wanted a modern looking invite with clean lines. 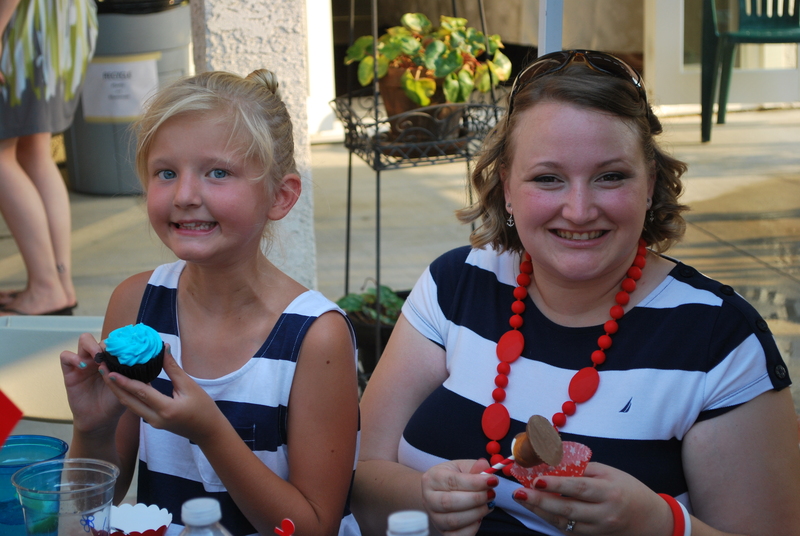 I wanted to celebrate the fact that they were opening their home and hearts to adoption. 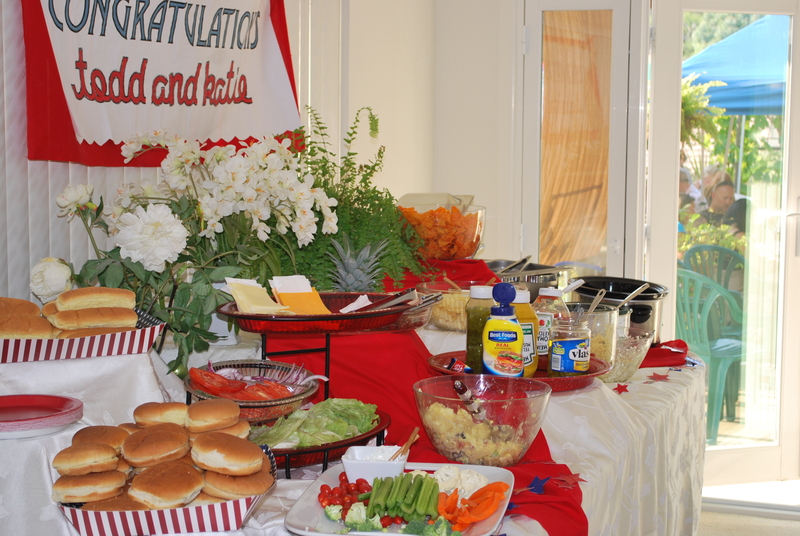 We decided to keep the menu simple by barbecuing, but we made a beautiful buffet in the dining room. 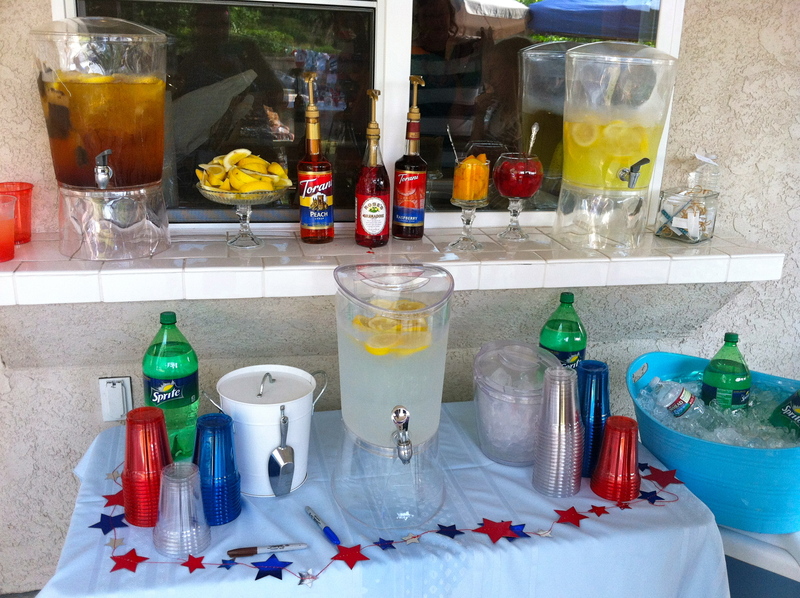 For the drinks, I kept it simple again, by sticking with lemonade, iced tea, and water. But I classed it up a bit by putting out some fancy garnishes and flavoring syrups. The drink station was a hit. 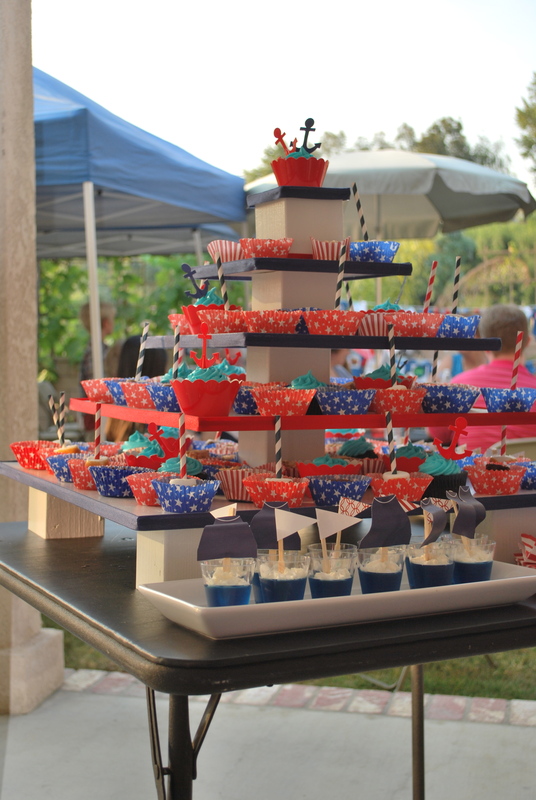 For dessert, I wanted variety, so I got out this cupcake tower I built a while back and changed the ribbon to match this party. I made a gluten free cupcakes, caramel and chocolate dipped marshmallows, and Neapolitan rice crispy treats dipped in white chocolate. We also made jello-boats and the mother of the dad-to-be brought some gluten free lemon cookies and brownies to add as well. I wanted the whole event to be very special, of course, and there were so many things I wanted to include. That is why I decided to keep the menu simple and elegant (if I’m allowed to use the word elegant to describe hamburgers and hotdogs). But keeping it simple allowed me to spend more energy on some of the decorations and games. I will share those in my next post. 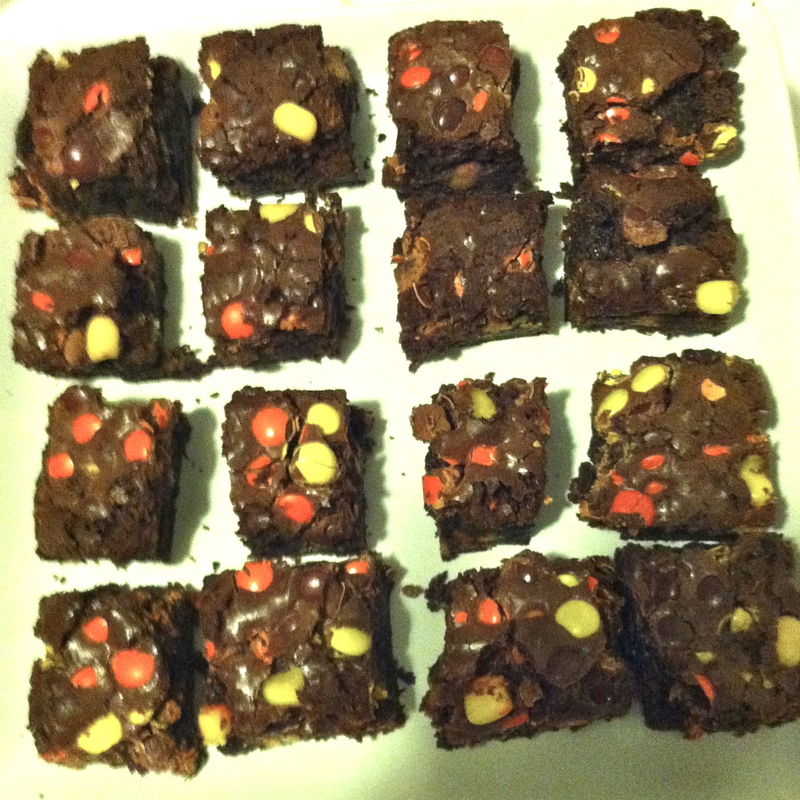 I know, I know… everyone has recipes for your left over Halloween candy! I laugh because most of those recipes refer to how you don’t want to eat all the candy and then suggests baking it into cookies or other wonderful pastries (which apparently you’re not supposed to eat?). That really makes sense to me, make a dent in your kids’ stash by multiplying it into more junk food. Well, I am going to offer you an idea of something fun to do with your excess goodies, but I won’t suggest that this is a better or healthier option that just eating it. And here it is… simple as can be. Just chop it up and throw it in your brownies. That simple. 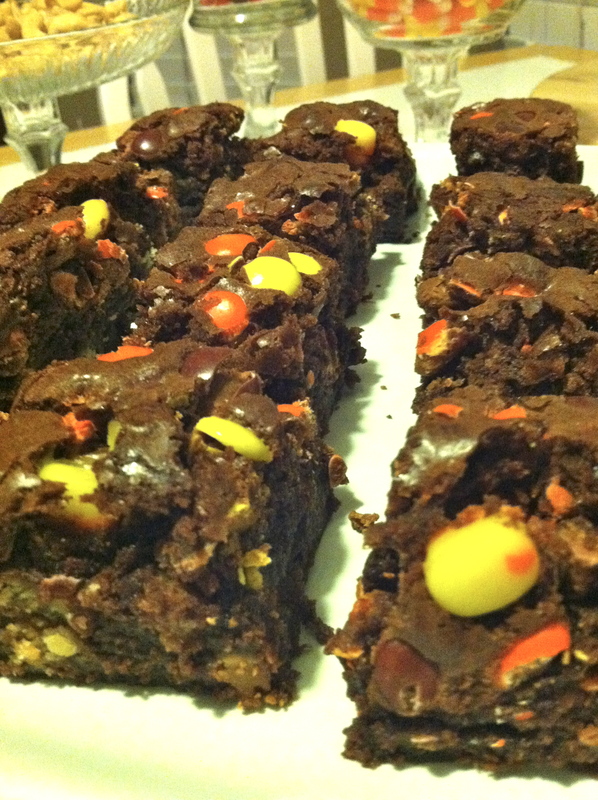 Use whatever brownie recipe (or box mix) you have on hand. 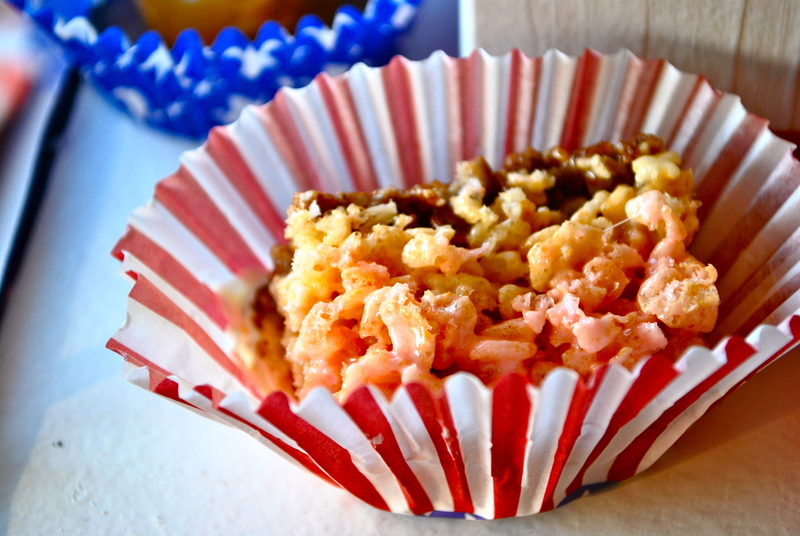 Then chop up your favorite candies and mix them into the batter. 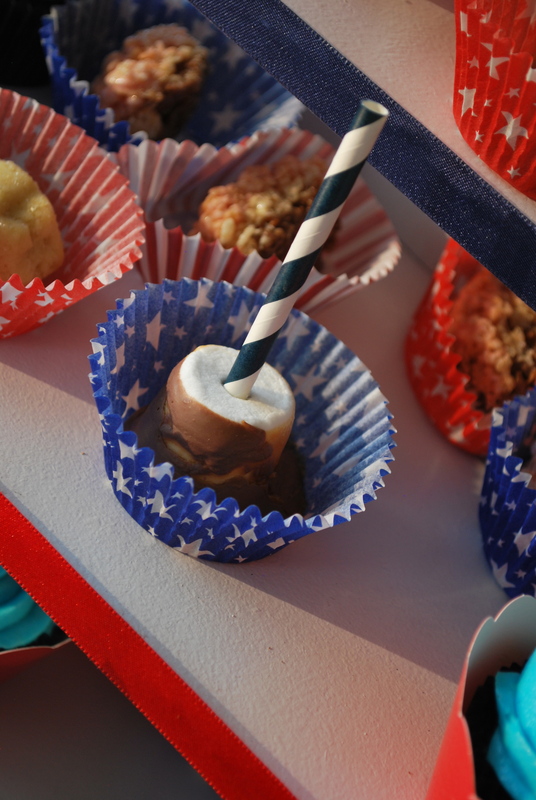 Save a handful of the candies to put on top of the brownie mix right before you put it in the oven. This will make sure the candy is visible and that your friends and family will know what they’re about to get in to. While you can really go in whatever direction you want with this idea, I do have a routine that I like to use. First, I really love Ghirardelli Brownie mix. It’s so so good and rich. And, you can buy a big box with about 6 bags of mix in it from Costco. I also like to double the recipe for a 9×13 pan. This makes for thick brownies that feel really gourmet. When I added my candies this time around, I held on to the most colorful candy to put on top. I mixed in a king sized Snickers bar, a king sized Reese’s Peanut Butter Cup pack, and a king sized KitKat. I top the batter with Reese’s Pieces and a couple candy corns. 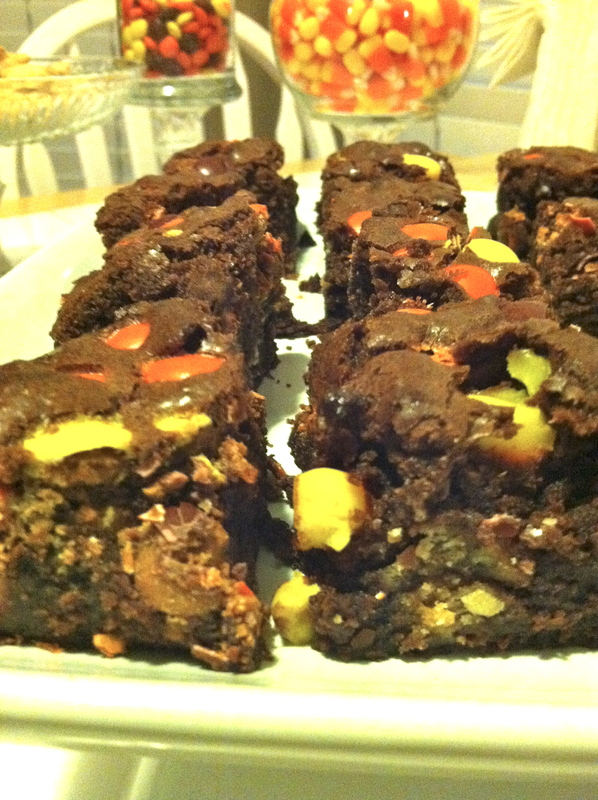 Look at all that yummy-ness packed inside those brownies. Your friends will think you slaved for ages over these guys, but they are so so easy.